Here’s our comprehensive guide to Sekumpul waterfall, a must-see on any Bali itinerary. We’ve covered all the essential information, including how to get to Sekumpul, entrance fees, and things to know before visiting. We hear the unmistakable roar of Sekumpul Waterfall before we see it. “This way”, says our guide, Kadek, who hurries along the path, analysing our expressions for a hint of excitement. We round a corner, step down a few stairs and lay eyes on Sekumpul Waterfall for the first time. "How is this even real?”, gasps Mark, his jaw firmly planted on the ground. It’s a question we’ll ask ourselves again and again over the next three hours as we explore Bali’s most incredible waterfall. A layer of mist hangs in the air, shrouding the magnificent twin-falls, which drop 80m to the valley floor below. Deep-green forests cling the the hills as trees crane towards the sky in search of sunlight. It’s like a scene from Avatar, only this is real life. 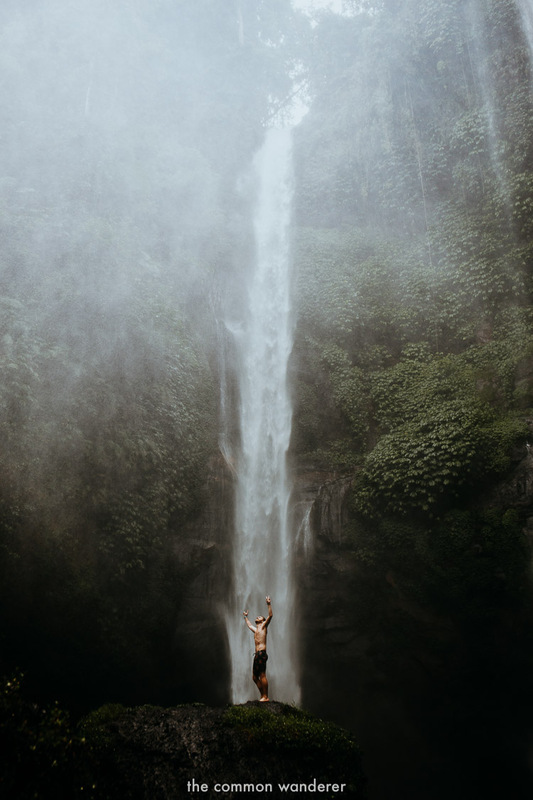 We’ve visited Bali’s tallest waterfall as part of a day-long waterfall mission in northern Bali, enjoying the thrills and spills of Aling Aling before making our way through the misty hills of Silangjana to Sekumpul. We arrive to an empty car park, pay our entrance fees, and sign up a trusty guide, Kadek. The walk down is slow and steady - the pathway slippery from the incessant tropical rain that accompanies this time of year. After what feels like a thousand steps, we arrive at the valley floor below, greeted with the moody, moist environment of Hidden Falls. It’s completely surreal. Water vapour fills the air, floating away with the forceful winds of the falls. We take off our shoes and explore further into the cavernous environment, standing under what seems to be an endless number of waterfalls. We’ve not ever seen anything like this. After photographing away for what seems like an eternity, we’re hurried along by Kadek to our final stop; the base of Sekumpul. If the view of Sekumpul from above was jaw-dropping, the scene from below is mind-boggling. Water cascades from 80m above at a rapid rate, hitting the rocks below with such force that the surrounding area is completely covered in a thick, rain-like mist. Within seconds we’re completely drenched from head to toe. We stand, grinning from ear to ear, staring in awe of the nature’s power. It’s honestly one of the best travel moments we’ve ever encountered. It’s from here that the best photos are taken, so we happily snap away (thanks to our buddy Ben from The Voyager Tales for a few images in this post! ), completely seduced by mother natures finest of creations. We leave, but not before picking up as much rubbish as we can find. Joined by Kadek, who just so happens to be the local leader of the ‘Trash Heroes’ movement, we’re keen to leave this natural beauty better than we found it (read our guide on how to be a responsible and eco-friendly traveller here). . The hike back up is the day’s only downside; we’re so drained from the adrenalin and excitement that we barely have enough energy to drag ourselves back to the top. We somehow manage to, and after tucking into a sugar-filled Cornetto ice cream, we all agree that this is one of the best days we’ve ever had. Keen to visit Sekumpul falls and have yourself the best day ever? Below we’ve put together our comprehensive guide to Sekumpul waterfall, with all the information you need to find and explore this natural Bali beauty. Where is Sekumpul Waterfall (Air Terjun Sekumpul)? Sekumpul Waterfall (Air Terjun Sekumpul in the local language) is located in the northern mountains of Bali, around 2.5 hours drive from the main tourist hubs of Canggu, Seminyak, Kuta and Ubud. Although Sekumpul waterfall is must-see on any Bali itinerary, it’s a little off the beaten track and quite hard to get to. Therefore, we recommend hiring a scooter and riding to Sekumpul yourself, hiring a driver (a driver and car can be arranged for around $50 for the day, through your accommodation), or visiting as part of an organised tour. Our directions below are based on hiring a scooter and riding to Sekumpul yourself. Not only is the ride through the hills of Bratan picturesque, it's by far the quickest way to get to Sekumpul. Be warned though; the road to Sekumpul waterfall is very windy and steep in parts and is the main route between the north and south, making it extremely busy throughout the day. Take your time, drive safely and try to break up the drive with a few rest stops. Scooters can be hired from any of the main tourist hubs in Bali, and cost around IDR 50,000 - 70,000 per day (USD $5). From north Bali, follow the Bedugal - Singaraja Rd. towards Bedugal lake for around 45mins. Keep an eye out for the Sekumpul waterfall turn off on your left as you near the top of the mountain. From this turn-off its a long, windy 30min ride through forests and small mountain villages until you arrive at the designated carpark and waterfall hike starting point. We stayed in northern Bali near Singaraja and would definitely recommend making the trip to Sekumpul waterfall from here. The drive is quicker and easier, and can be included in a visit to Aling-Aling and Git-Git waterfalls in a day. The drive to Sekumpul from Canggu, Seminyak or Kuta is around 71kms, or 2.5 - 3 long, windy hours. Head north, following the Denpasar - Singaraja Rd. Passing through the town of lake town of Bedugal, head up and over the Wanagiri rest area before starting your descent down the mountain. After about 10mins, turn right towards Sekumpul waterfall, following the signs. From this turn-off its a long, windy 30min ride through forests and small mountain villages until you arrive at the designated carpark and waterfall hike starting point. We recommend breaking up the journey by stopping Leke-Leke waterfall, or at the Strawberry Hills to sample some of Bali’s famous strawberries. 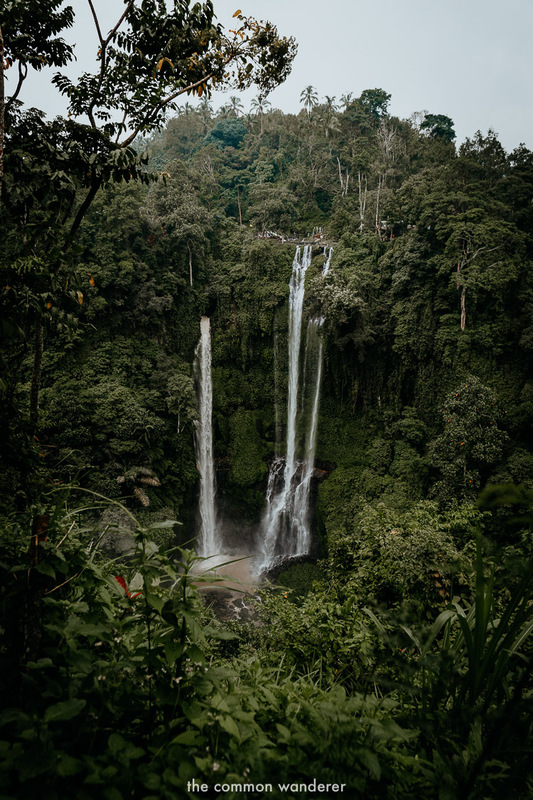 Getting to Sekumpul waterfall from Ubud takes around 2.5 hours, and while it is possible, it's a bit of a mission and one we’d recommend breaking up with a stop at Leke-Leke waterfall. From Ubud, head west until you hit Denpasar - Singaraja Rd. Follow the road north through the town of lake town of Bedugal, before passing the Wanagiri rest area before starting your descent down the mountain. After about 10mins, turn right towards Sekumpul waterfall, following the signs. From here, it's windy 30min ride through forests and small mountain villages until you arrive at the designated carpark and waterfall hike starting point. All up, the journey is around 67kms. The below map gives you directions from Singaraja, Canggu, Seminyak, Kuta and Ubud to Sekumpul waterfall. There are three types of entrance fees to Sekumpul waterfall - view only, medium trekking and long trekking. Due to recently passed regulations, these fees have increased substantially over the last few months. These regulations insist that each visitor to Sekumpul waterfall is now required to hire a guide for the duration of their visit. This is in part to for visitor safety, but also to support the local economy, maintain infrastructure, and respect local customs. While the fee may be quite expensive, we think it’s a good measure as it will help maintain the beauty of Sekumpul, as well as support the local economy in general. Upon arrival, you’ll need to pay the entry fee, at which point you’ll be handed over to your guide to start the trek down to the falls. The 'view only’ fee is IDR 20,000 per person and allows viewing of Sekumpul waterfall only. The 'medium trekking' option for Sekumpul waterfall is IDR 125,000 per person. This includes a guide, donation to the local village, and visiting both Sekumpul and Hidden waterfalls. This is the option we recommend. The ‘long trekking’ option to Sekumpul costs IDR 200,000 per person and includes a guide, donation to the local village, and visiting both Sekumpul and Hidden waterfalls, as well as the triple-falls of Fiji waterfall, which is a short hike away. There’s also an inclusion of bottled water - please refuse this and bring your own re-usable water bottle - there’s enough plastic in Bali. The hike down to Sekumpul waterfall is rather steep and arduous, but it’s absolutely worth it for the incredible views. Starting in the car park, the hike winds through a number of small villages before arriving at Sekumpul’s main viewpoint, which provides a stunning view of the falls from above. We recommend taking a few photos from here before following the stairs down to the base of the falls. Arriving to the valley floor, your guide will take you a short distance to Hidden waterfall, an ‘Avatar’ like environment where greenery hugs the surrounding rocks and water falls from just about every angle. It’s a completely surreal environment. From Hidden waterfall, the hike takes you through the rushing creek before arriving at the base of Sekumpul waterfall. The view of the towering waterfall from above will make you feel incredibly small. You’ll likely get soaked to bits here, but it’s all part of the fun. After admiring the incredible surrounds, you’ll begin the 30 - 40min hike back to the carpark. Following what feels like a never-ending pathway of steps, this is probably the toughest part of the trek. Allow for around 3-4 hours to explore the area properly. If you want to witness Sekumpul waterfall at its most powerful, we recommend visiting during to March - April, at the end of the monsoon season, when the rivers are full and the falls most impressive. We visited Sekumpul at the end of March and were able to get a true understanding of the beauty of power of this natural phenomenon. That being said, the area was extremely wet and made exploring and photography quite difficult, especially at the base of the falls. If you do visit during this time, be careful on the slippery rocks, and take a dry bag for any camera gear. During the dry season (May - September), the falls reduce in size and power, however it’s much easier to explore the surrounding area. On the road towards Sekumpul waterfall, you may encounter a number of ‘registration’ points, that read “Sekumpul registration”. Ignore these. These ‘registration points’ are nothing more than a scam to get unaware tourists to pay ‘registration fees’ to visit the waterfall, or to join their hiking tour, which is apparently the only way to visit the falls. It isn’t. Make your way past these 'registration points' until you reach the official Sekumpul waterfall car park, located here. As we mentioned above, the falls can be quite expensive to enter. Due to recently passed regulations, the cost to enter has increased to support the local economy, maintain infrastructure, and respect local customs. The entry fee also includes a guide who will keep you safe! Entry fees to Sekumpul waterfall also include a local guide. Our guide, Kadek, was a local who’d worked in the tourism industry around the world, but returned to Bali to build a life in his own village. He was extremely knowledgeable and patient (we took forever taking photos! ), and manages his local chapter of ‘Trash Heroes’, helping keep the area rubbish free while educating his local community on the ills of plastic pollution. In other words, Kadek was a legend. We’re pretty fit and even we were struggling with the walk down to the falls (we’re getting old…), so be prepared for a LOT of stairs and a lot of strain. That being said, the views from the bottom are totally worth it, and make any minor aches and pains go away immediately. There are some incredible photos you can get from the base of Sekumpul waterfall, however during wet season the area is extremely slippery. Be careful when traversing the area as one small slip could end up in a decent injury. We recommend packing suitable footwear that has decent grip. We noticed rubbish at the base of the falls so did our bit to conserve the local environment by collecting an adventure bag. Our guide Kadek joined in and before we knew it we’d picked up half a bag of rubbish. If you’re heading this way, bring a bag (or buy this tote!) to pick up any rubbish you see, and leave Sekumpul better than you found it. For the photographers out there, Sekumpul is a dream. From above, it’s awe-inspiring. From below, it’s powerful and raw. And on the way, it’s green and breathtaking. The best photos can be taken below the waterfall, where there are number of vantage points from which to get the perfect shot. Be warned though, there’s a LOT of spray from the falls, meaning your lens (and camera) will likely take a soaking. Keep a lens cloth handy to wash the spray away (always keep this in your camera kit! Check out our photography kit here). Hidden waterfall is an ‘Avatar’ like environment where waterfalls seemingly drop from all angles. The mist creates the most moody of environments, making it a cool place to shoot. As always, arrive early for the best light and the least crowds. We recommend staying in Northern Bali, near Singaraja or Lovina. There are some awesome incredible accommodation options for all budgets. Search pricing and availability for hotels in Singaraja and Lovina here. Let us know if this Sekumpul waterfall guide was helpful in the comments! Alternatively, if you’ve been and there’s something we’ve missed, let us and other travellers know! After more tropical adventures? Check out these posts!